THE SESSIONS #138 BEER BLOGGING FRIDAY The Session, a.k.a. 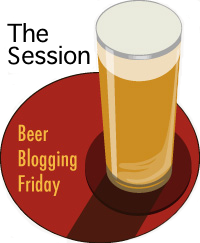 Beer Blogging Friday, is an opportunity once a month for beer bloggers from around the world to get together and write from their own unique perspective on a single topic. Each month, a different beer blogger hosts the Session, chooses a topic and creates a round-up listing all of the participants, along with a short pithy critique of each entry. I will suggest a few themes to stir your imagination on "The Good in Wood" but of course you can choose your own path. Send me the link to your posts in a comment to this Announcement by Friday, August 3 and I will post the Roundup shortly thereafter. I'm looking forward to reading about your Good in Wood adventures.